My polish-related new year's resolution is to wear more of my untrieds. I'm coming along, but I'm still buying more than I swatch. Gotta work on that! I'm working on another post that's not quite ready (MUA'ers can see the swatches though), so I'm tossing a couple of my former untrieds at you today. Hedy's Purple Nurple is a dark purple with blue and fuchsia shimmer. I'll fess up...I bought Purple Nurple partly for the name. It's a pretty color, but my inner 5-year-old giggled and made me buy it. Sometimes being childish pays off! This is three coats, but the formula is terrific otherwise. It glides on smoothly and evenly. It's also gorgeous! You might recognize it as the base for my swatch of Wet n Wild Stick It To The Man. Hedy's seems to only show up at Rite Aid and completely randomly. I bought Purple Nurple a few months ago, but it was randomly in another display so I have no clue how old it is. Sorry! 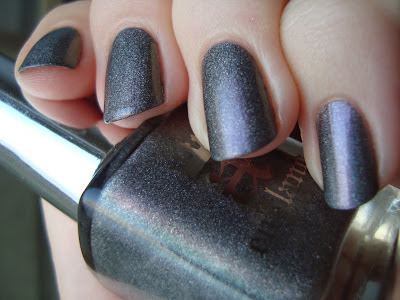 A England Ascalon is a dark gray shimmer with a fuchsia-to-green duochrome shift and very fine scattered holo effect. This is another polish that showed up on my doorstep looking for a good home. I finally swatched it because it was the first untried on my spreadsheet alphabetically. This is two coats and I felt like it wanted to be brushstrokey, but it turned out ok. I have mixed feelings on polishes with multiple effect finishes and I wasn't quite sure what to make of Ascalon. There's a green side to the duochrome flash that really doesn't show up here at all, but the holo was a bit flat. I feel like the holo and duo battle it out in polishes like this and this time around, the duo wins. So two down, about 6 more photographed, and maybe 725 to go. I'll be at this for a long, long time! There are so many gorgeous things just sitting in my stash, loved but unworn. I really want to get at them...so little time and so few fingers, but I will get there in the long run! I love how the Purple Nurple polish looks but I wouldn't have the patience to do three coats to get the desired look. I am terrible at smudging my nail polish and I feel that by the time I hit 3 coats, I would have to do at least 2 more to make up for the nails that I messed up. I'm almost not sure about that silver polish either, a part of me thinks oh that looks really lovely and the other part of me is like I would never wear that. I'm a terrible klutz, so I know what you mean. It takes mindfulness and quick dry top coat to get any mani safely dried on me. Doing each coat right after I've done the previous coat on all nails helps and rarely causes issues. Waiting for each coat to dry completely is unnecessary, since the new coat will soften anything below it. As for Ascalon, yeah...it'll probably linger in my stash and I might give it another try sometime. I want to love it, since it seems so "me", but I only just like it.